Choosing the best piano for those who are recently started to learn how to play may not an easy task moreover if you don’t have people near you with more experience who can provide some advice. 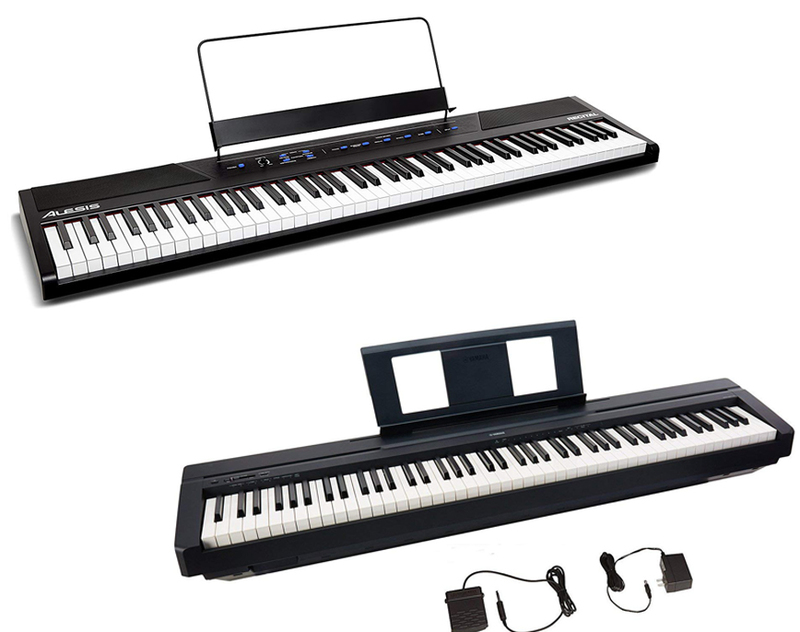 In Alesis Recital vs Yamaha P45 article today, we are going to compare and give you more information regarding these two beginner friendly electric pianos and if there is any, how they are separated from each other. If one or both of them took your interest, go check our article below. There are so many options available when you are going to hunt for some electric piano but those suitable for beginner are not that much since besides affordable, you must also want to get the one that offer the best value for your money. 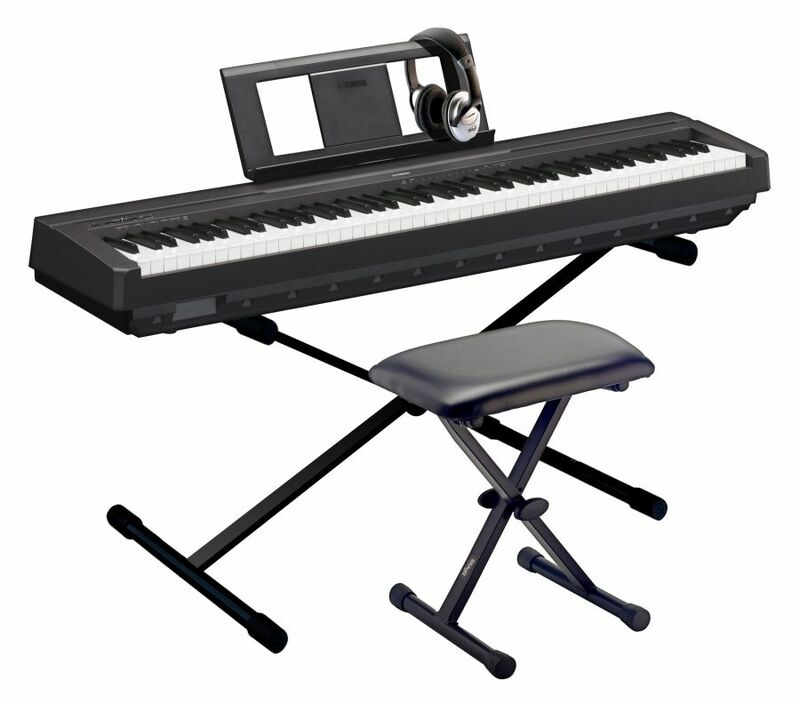 One of the most popular electric piano aimed for new-entry users is Alesis Recital. This piano has a good reputation thanks to the manufacturer with their long history in making quality instruments. It is offered in a friendly price tag yet coming with a surprising quality. From the outside, Alesis Recital already look pleasing with a simple design that clearly made to suit beginner users. Its keyboard is said to be good enough to train player with their skill as a pro pianist without having to spend hundreds of dollars. It has a futuristic look with LED buttons making it giving such a cool vibe. Overall body is light and slim, so you can always store it easily in almost living space. It comes with 88 full-sized semi weighted keys and you can even adjust the sensitivity. The aforementioned keys will give you a realistic and natural touch, so you can have a similar experience as playing an actual acoustic piano. However, since this is a low-entry model, you shouldn’t expect much on them regardless, it is still decent enough to give you the impression with a low price point. The piano also has numerous built in instrument voices with 128-note polyphony, 5 in total to allow you to create different pieces with different sound. For example, original acoustic piano with those rich full tones. Another example is organ with its old timey sounds while the synth can give you that polyphony synth to get that techno feel. The rest are electric piano and bass voice to give you rich cool pop feel and incredibly low tone respectively. Reverb Chorus and Chorus customization is available here to help you creating the sound exactly just like what you want. Since it comes with 20-watt built-in speakers with its rich and realistic sound, you don’t have to use external speaker anymore. Besides all of those points, Alesis Recital is having another selling point which is the superb educational features. It has “Lesson Mode” that will splits the keys into two separate section of keyboard while still able to provide the same pitch and voice. This feature is good to help teacher teaching their students to play alongside each other without having to take turns on the keyboard. The choice for entry-level or beginner level electric piano is still got a long list to go but the closest rival of Recital is Yamaha P45 since their price gap is narrow. The company also competing with each other by releasing their own version of beginner level pianos and has been recorded to offer great products along the journey. This piano itself is released to replace the older model P35, so if you ever use or play it, you will find so many similarities between the two. Read other beginner pianos on Yamaha P45 vs Korg B1 here. 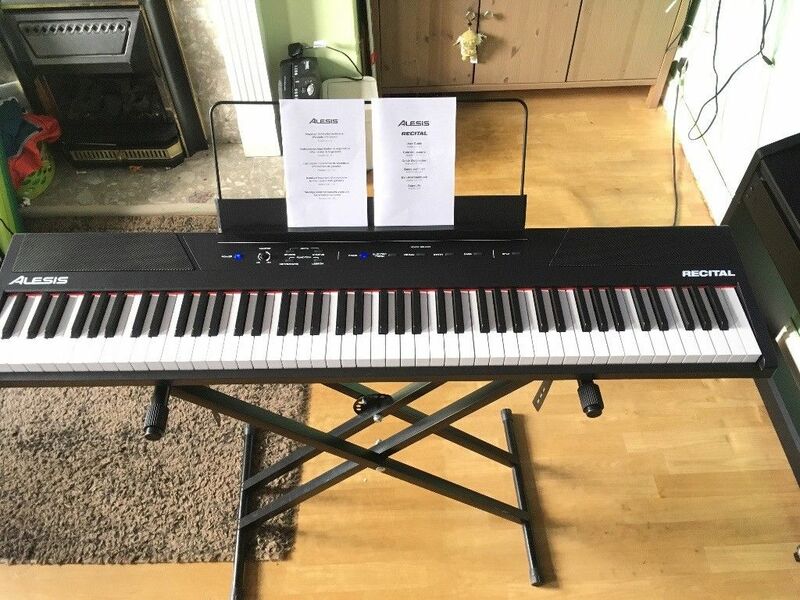 Yamaha P45 only available in black color form and from the outside, there is nothing special happening on the surface either; it is clearly build for new user with a very little functions you can use. It might make some people with more experience lose interest but it is actually great for people who just start learning since they won’t need any complicated features yet and more focus on polishing their basic skill first. It comes with full 88-keys of the company’s graded hammer standard keyboard. What most people love about Yamaha P45 is the keys because even though it is cheaper, you can have a similar experience to playing a real acoustic piano. For those who are not familiar with GHS yet, basically, the keys will get heavier when you move down the range of the piano. Another great capability from the feature is it is also fully adjustable. The options are consisting of first, Soft with the velocity affected by the touch but only for a little. Second is Medium to make it closer to the real piano feel but still have some leeway, third is Default to mimic actual piano to its most similar feel, and last is Hard for more advanced players who want some extra challenge. As for the output, it comes with two 12-cm built-in speakers powered by 6 W amp each which is definitely not enough except for practice, but the quality is decent and pleasant. The Yamaha P45 is doubling the amount of polyphony you can find in P35 from 32-note to now 64-note. For the presets, you can get 10 sounds available here to enrich your composition. There are two pianos, two organs, two electric pianos, and two harpsichords as well as patch for strings and patch for vibraphone. Now, let’s compare Alesis Recital with Yamaha P45. As you can see, both of them are using full 88 weighted keys and equally offered for beginner. What separate them are first the polyphony because Recital is topping at 128-note while P45 only has 64-note. Another difference is on the preset sound since P45 has more sounds than Recital. However, Recital speaker is louder than P45. All in all, the decision is all yours to make. In our opinion, you can choose the one that match your preference or the one that provide better capabilities in your eyes. However, when considering the price and features together, if we are to choose we will recommend you Alesis Recital since it is more affordable and has more polyphony count than Yamaha P45.